If you are thinking about Moving to Ireland or if you are looking for information about Living in Ireland – here at Irish Links we have plenty of advice and useful resources to help you. The recent decision of the UK to leave the EU has seen an increase in people looking for information about moving to Ireland. You will find free information and advice about living in Ireland : – Irish Citizenship , Removals to Ireland , Exchanging Currency , Getting an Irish Passport . Finding Jobs in Ireland , Bank Accounts, Pensions, Irish Income Tax, Credit Cards , Irish Car Tax in Ireland . Mobile Phones, Broadband and much much more. Living in Ireland has a lot going for it , despite the economic problems of the last decade. The Irish economy is in a strong position in 2019 having recovered impressively from the financial crisis and the subsequent recession. In early 2012, the unemployment rate was 16% and almost 50,000 Irish people emigrated that year. Seven years the seasonally adjusted unemployment rate is down to 5.7% and involuntary emigration has ended. The Central Statistics Office estimate that 90,300 people of all nationalities moved to Ireland between April 2017 and April 2018 . This is an increase of 6.7 per cent from 84,600 the previous year, while the numbers emigrating fell 13.1 per cent from 64,800 to 56,300. This resulted in a net inward migration of 34,000, the highest level since 2008. 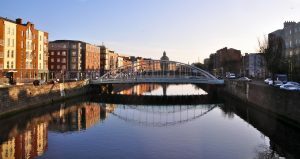 Property : Irish house prices dropped by more than 50% from their peak in 2008 – which was great for anyone looking to buy a house in Ireland. The house prices in most areas are rising again – and now may be a good time to think about buying a home in Ireland again. There are still a few bargains to be found. In Ireland the personal taxation levels are still amongst the lowest in the OECD. For companies relocating to Ireland – the corporation tax is still one of the lowest in the world at 12.5%. Ireland is the only English-speaking country that operates within the eurozone. Job vacancies have been increasing since 2015 after several years of slowdown. The construction sector was the main area of slowdown but many major IT related companies such as Microsoft, Google, Amazon, Twitter, Paypal ,Ebay ,Facebook HP, and Intel have located their European headquarters in Ireland. Skilled IT staff are always required as well as people with language skills . The pace of life when Living in Ireland is very relaxed. Irish people seem to know that life isn’t just about the daily stresses and strains – but more about family, holidays , celebrations and having a laugh with friends. Maybe your ancestors left Ireland many years ago – and you now want to return to your Irish roots. Maybe you or your parents were born in Ireland and are thinking of going back “home” or even retiring in Ireland. Whatever your reasons – you should find some useful information here to help you if you are moving to Ireland .